Three years ago today I made an 8 hour road trip, mostly through snow squalls and a blizzard in northern Ohio to meet up with “Santa Paws” to rescue Whitby and give her a forever home. For Whitby, it was about a 14 hour road trip from start to finish and she was a real trooper. She loves to ride in the car. 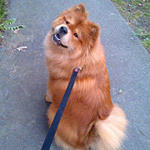 She is a beautiful red chow and will be 10 yrs old in the Spring. Her joints are a little stiff due to Mr. Arthritis setting in and steps can be a challenge at times. But… you should see her try to chase a cat and she can be a real puller on the leash. Makes you want to scratch your head in wonder. I was told Whitby was named after an art museum in London, England and yes! She is a piece of work. Gotta love her! Here is Whitby’s story. I had lost my beloved 15 yr old Chloe in January 2011 . In August that year I started to get a nudging feeling from Chloe’s spirit to go on a quest for another chow to fill the void she’d left in my life. I came across cc.org, and am so thankful for it! In October I came across a posting looking for a home for Whitby. Her owner had passed away and a neighbor was trying to help the husband find her a new home. Santa Paws, as I call the neighbor, and I corresponded back & forth and there were ups and downs dealing with the owner. Santa Paws went to Calif for Thanksgiving. She returned home to find the husband gone, his home up for rent, the phone disconnected, and Whitby no where to be found. She was heartsick. As luck would have it, in talking to some friends of hers, she found out that one of them, who volunteers at a local shelter, told her that a chow had been dumped off there. She went to the shelter and there was Whitby. Santa Paws and her husband “adopted” Whitby and the plans for the winter road trip were put into motion. I didn’t find out until 10:30 the night before the trip that all was falling into place and the road trip would be a realty. Yes!! Talk about butterflies being on the loose. I was so-o excited & couldn’t believe this was happening. What a great early Christmas that turned out to be! Thank you cc.org and “Santa Paws” for making this all possible for Whitby and me. Merry Christmas & Happy New Year to all of you and your fur babies. Happy gotcha day Whitby! I remember reading about Whitby's story at the time, she is a very lucky girl to have found such a wonderful home with you Pam. I don't get on the forum as much as I used to these days but I am glad I saw this. Cocoa and I wish you a very Merry Christmas and Happy New Year too! Pam so glad you got Whitby, she's been a real chow character from the get go!! Hope you have a wonderful Christmas I know it's a special time for you two!